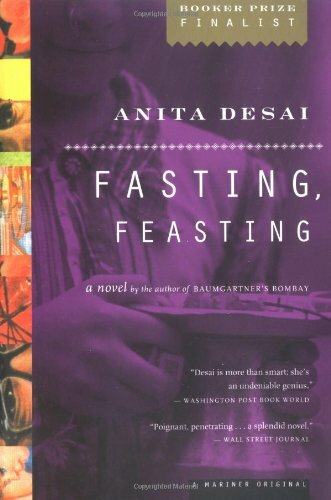 Fasting, Feasting by Anita Desai, Houghton Mifflin Company, 1999, 228 pp. The title drew me in. (Also, I’ll admit, the Booker Prize Finalist sticker on the cover.) The title made me think this book would have some rich theological insight hidden inside, even if it never mentioned God. Fasting and feasting are such rich concepts for contemplation. The book did follow its title with interwoven threads of deprivation and abundance, although it did not capture my heart and mind as much as I had hoped. The story is told in two parts, from two central characters. The first part takes place in India, and focuses on Uma, the eldest sister of an aspiring middle-class family. Uma is a bit slow-witted and physically clumsy, but she has dreams for her life. However, at every turn, her parents thwart her aspirations and turn her into a servant in the household. Her prospects for marriage crumble, and she is denied even the simplest pleasures. She is not alone. Nearly all the women in the story are bound in service to men, their own dreams unsupported and unsustained. The second part takes place in the United States, and focuses on Arun, the youngest child and only boy in the family. The family (especially Uma) sacrifices everything so that Arun can succeed, achieve and prosper. While it seems that he has everything, he longs desperately for affection. During his time in the United States, the land of plenty, he sees the elements of physical and emotional deprivation in American family life, even as he himself goes hungry rather than eat meat with the host family. The novel is beautiful, intricate and run through with allusions to various kinds of fasting and feasting. At times, it felt a bit heavy-handed to me, like it was a morality tale or parable about abundance and deprivation, rather than a novel. Uma felt more like a real character about whom I cared than Arun did. I yearned for redemption in the story, but hunger won out over satisfaction for both Arun and Uma. This is a book I appreciated more than I enjoyed, recognizing its merits while never quite falling under its spell. 2 Responses to "Book Review: Fasting, Feasting"